We are grateful to Steve Stroud for taking part in this event for KHMT and for all those who sponsored him. Here Steve tells us how it went. 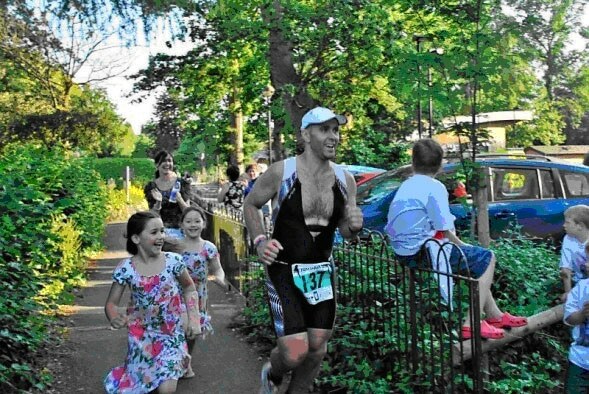 “Forestman is a full distance (aka Ironman) triathlon event. 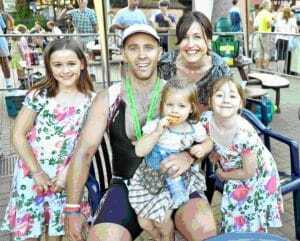 It consists of 3.8km open water swim, 180km cycle ride and 42.2km run. This was my first attempt at the distance and I was very pleased to complete Forestman in 13 hours and 21 minutes. When I visited the lake the day before, I could not have wished to swim a 3.8km damopen water event in better conditions: However, the following morning at 5:30, things didn’t quite feel the same. Apart from the pre-race nerves, the amount of breakfast I’d eaten at 03:00 that morning I was very glad I’d seen the lake the day before, we couldn’t even see the first buoy let alone the end of the lake! The mist had delayed the start by 30 minutes while the buoys were moved closer together so that we had a vague chance of heading in the right direction. It did make the swim very interesting as we followed the feet of somebody in front, hoping that the leader knew the direction. It was easier to follow the guy ropes under the water for direction than try to spot the next buoy. Just over an hour later (1:05) later I had finished the swim and was running up the path to the first transition area. Thankfully mine wasn’t the only bike left in transition, in fact well over half the field were still finishing their swim. Within the first 6 miles I realised I wasn’t going to break my sub 4 hour personal best for a marathon. Partly due to the heat and partly the hills! I was not expecting 13 of the toughest inclines I’ve ever run. However, almost 6 hours of run/walking later and I was out of the forest trails and back on tarmac knowing there was only 2 miles of downhill running left. I still can’t believe how that fact can spur you on so much. I think that final 2 miles was run at my fastest pace all day, and when I entered the final run shoot and saw my family there ready to cross the line with me even the freshest legs would have struggled to keep up!